Originally bred in Germany – The Weimaraner was originally bred for hunting in the early part of the 19th century. They were large game hunters favored by royalty and their prey was bear, boar and deer. Later, they were used to hunt fowl, rabbits and foxes as the popularity of large game hunting declined. They were named for a Grand Duke Karl August, who enjoyed hunting and whose court was in the city of Weimar. Today, they are a family dog, living inside as a member of the family. This resulted in a dog which does not do well living outside and suffers badly from anxiety if left alone in the house for long periods. The modern Weimaraner is an excellent dog for agility. Weimaraners are happy, active dogs that are athletic, graceful, intelligent and highly trainable. They have high energy level and their endurance means they often need training to learn patience and self-control. However, their willingness to please their owners makes training a pleasure. A well-trained Weimaraner will be a strongly-bonded, extremely close companion but needs early, consistent and kind training to become a controllable pet. Because they bond so strongly with their human companions, Weimaraners are excellent watchdogs. Some Weimaraners may not tolerate living with cats or smaller dogs. Their strong prey instinct means they need strict supervision around cattle, sheep or goats. If feeling threatened they can be initially wary of other dogs and need good socialization at an early age. Neglect of this breed’s mental and physical stimulation will create boredom, which can lead to excessive barking, hyperactivity and destructive behavior. 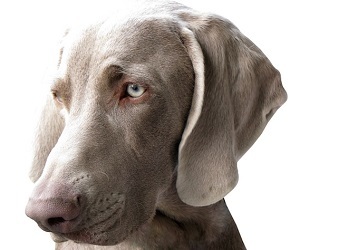 The Weimaraner has a low-maintenance, care-free coat with no undercoat. While this means minimal brushing, it also means the dog can suffer from cold quite easily and should not be kenneled outside. From early adolescence, a Weimaraner needs a lot of exercise as it was bred for the physical stamina needed to chase and hunt. They will not be satisfied with a walk on a leash once a day – a good run in a secure, off leash area will help to tire them out. Weimaraners are wonderful playmates for older children, but need supervision with younger kids as they can get knocked over due to the dogs’ size and energy level. The Weimaraner needs a confident owner who can persevere with training and socialization. It is not a dog for an apartment due to their high exercise needs. A large, escape-proof fenced yard is a must! Common hereditary problems Gastric torsion and entropion.